I gotta be honest. Writing this article wasn't very fun. 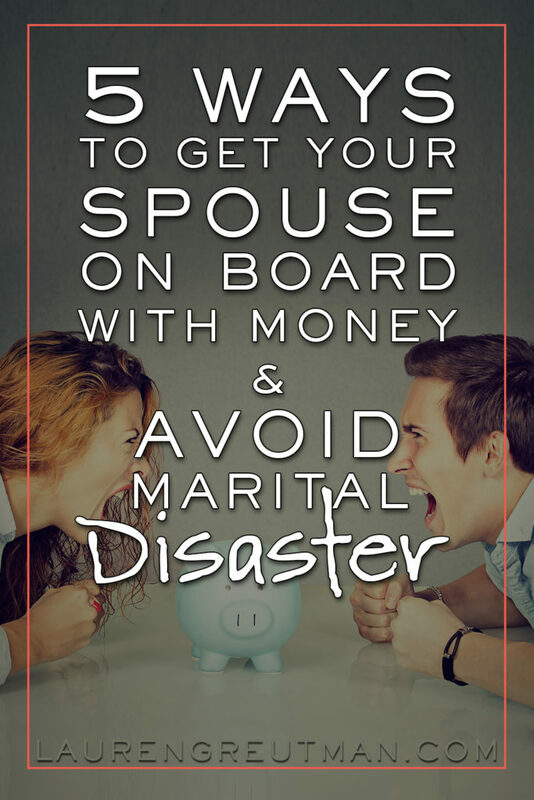 Getting your spouse on board with finances can be excruciatingly difficult. I get lots of emails daily, and some of the most powerless and helpless-feeling readers who reach out to me are those who feel stuck because of their spouse's reluctance to come together with money. Why? Because money and relationships can be hard. It takes real work. And believe me. I get it. When you are distant and not communicating with money, it flows over into other parts of a marriage. But – there are some steps to get back on track. These steps start out easy and fun – and that might be all you need. But unfortunately, this is a very serious issue and I understand that your marriage might be on the line. So the steps get increasingly more difficult and serious. Why is the interaction of money and relationships or money and marriage always seen as a challenge to overcome? I know why. It's because the average American family struggles with finances. It truly is a challenge to millions. But here's where I differ – finances in marriage aren't simply an obstacle to overcome, finances in a marriage can be a tool to help your marriage THRIVE. One partner makes all the money, and the other is given an “allowance” for groceries and other items, this is not healthy. You are not thriving. Both partners work and keep separate bank accounts with separate expenses. you are missing out on an amazing opportunity in your relationship. This also leaves open the opportunity to hide things from your spouse. One partner pays all the bills and is responsible, while the other has no clue what's going on, but is happy to spend the money. This is the relationship that scares me most and has a very high risk of ending in divorce. Set your first Budget Night with your spouse. Budget Night is simply one evening during the month when you'll look over your finances and plan how you'll spend your money in the next month. To make this work, don't pick the night that your favorite show is on or when you're super busy with stuff for the kids. Set your budget night and then treat yourselves with a date night for making it over that first hurdle. And since you've just done your budget, you know how much you can spend on your date! One thing to keep in mind with date night – it doesn't have to be about the food! Some of the best date nights I've had have been for just dessert or something like mini-golf. Eat dinner at home and then head out on your date. It will save you money, and you might even have more fun than the typical dinner date. I LOVE this step! One of the easiest and fastest ways to get on the same page with anyone is to make a shared goal. Dream a little bit with your spouse and pick a goal you'll both love. Something fun… like a vacation. Think of this goal as a reward for staying unified with your finances for a longer period of time. Since you both want the vacation, it will help you work together to make it happen. Of course, there are financial goals more important than a vacation – like paying off debt or saving for an emergency fund, but if you are reading this article, you are not yet on the same page with your financial goals. This is why it might be best to start with a financial goal that is fun and exciting. Once your partner is on board with the fun goal, figuring out HOW to attain it will likely bring up the other more important goals. Pinning down the reluctant party is going to be the challenging part, but if you did it for Budget Night, you can do it for this. One thing is for sure; this needs to be a positive discussion where you can dream and plan. If the tone of this discussion isn't positive and encouraging, it's going to be a drag. No “I told you so's”. Just dreaming and planning together. And I've got some help for you on this goal. I created a Financial Bucket List which lays out a framework to help you discuss your goals. Click HERE to download it and get started. Get the Financial Bucket ListPrint out 2 copies. You and your spouse fill one out separately. Then, compare and discuss your answers. Don't discount anything and don't react. Just listen. If this really is a list of things your spouse wants to do or accomplish before they die, it is really important to them. This can be a way for you to hear their underlying deep desires without having to address it directly. It could also be an indicator if your spouse is a Spender or Saver at heart. If you can agree and make a unified Financial Bucket List, you can really start making forward progress. This list is really is a list of all of the reasons you and your spouse want to make financial changes. But this may be a challenge. If your discussion turns the corner and starts heading towards an argument. Just pause until a later date. Communicate what money means to the future of your family, and how much his/her input means to you. If there have been mistakes – this is not the time to blame. This is the time to express how valuable their viewpoints are, and how you need their help. In reality, you can't have a fully healthy financial relationship if you are not unified in your finances. Yes. It is that important. It might be ok for a while, but it will not work the way it's supposed to in the long run without agreement. Whether they like it or not, the intersection of money and relationships has to be discussed at some point. If it gets to this, gently but firmly tell your spouse that you need them to sit down and talk about the family finances by a certain date. Don't be unreasonable, and don't make threats. I would even err on the side of being overly generous in your deadline (unless the bank is knocking at the door). Like if you wanted to give him/her a deadline of a week, give them a couple weeks to a month (or more depending on the situation). This will show them that you're serious about making change, but that you love them enough to wait for them… within reason. If the above 4 tips didn't work, it's actually not about the money at all… if it ever really was. You have deeper marital issues than money. It is time that you seriously consider getting some outside professional help. This isn't a sign of defeat, but an indicator that your marriage is just that valuable. That your love for your spouse is that deep. You can do this with our without your spouse. Obviously, with your spouse is better, but if they won't cooperate, let them know that you need to better yourself independently of them. Unfortunately, the statistics show a staggering correlation between money disagreements and divorce. You don't want that. And don't forget the download the Financial Bucket List! The priest marrying us recommended we talk with a certified financial planner. Has anyone else done this? I don’t really know anything about finding one or doing this.